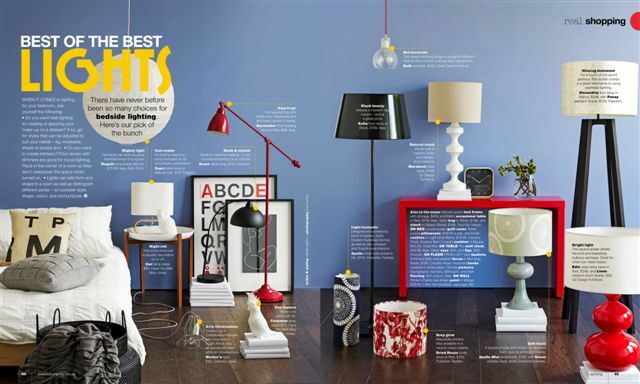 I can't believe that I almost forgot to post pics of the "Best of the best bedside lighting" shoot that's in the current onsale May 10 issue of real living magazine. It's partly because the shoot was on the same day as fridges, which seems like a lifetime ago. It's also because I was disappointed with the result. A whole box of lights from a wholesaler never turned up and was still lapping the country days after the shoot. As is often the way with these things, those particular lights were the ones I wanted the most. They were sculptural and interesting and were going to take the shot from so-so to wow - or at least I hoped. It was another agonising shot in terms of getting the right heights and playing with moving books and props a millimetre to the left then right and back again. I was under the trusty guidance of photographer Prue Ruscoe, and she said I was being hard on myself, but I'm still non-plussed by the shot. I think I prefer creating room sets. It brings out the inner interior decorator in me. These "best of the best" shoots might seem simple but they're actually quite hard. Not only do you have to source product that is new and design worthy but you also have to photograph them from cheapest to most expensive. Maybe I didn't do such a bad job after all. What do you think?